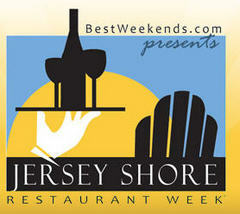 awwww yeah…it’s Jersey Shore Restaurant Week Nov. 4-14! One of my favorite events on the Jersey Shore is Jersey Shore Restaurant Week (*), which is taking place this year from November 4-14. As a Jersey Shore “Local” (year-round resident), I love the quiet months of October thru May, when summer tourists, summer residents and the “Bennies” pack up and leave. Not that I don’t appreciate how they stimulate a mostly tourist-based economy, but I appreciate the silence, the shorter lines and the lack of New York license plates. Jersey Shore Restaurant Week is like a “thank you” to the Locals and me. In exchange for putting up with all the summer craziness, I get one week of access to over 65 amazing restaurants (that actually serve great food) at cheap prix-fixe pricing.